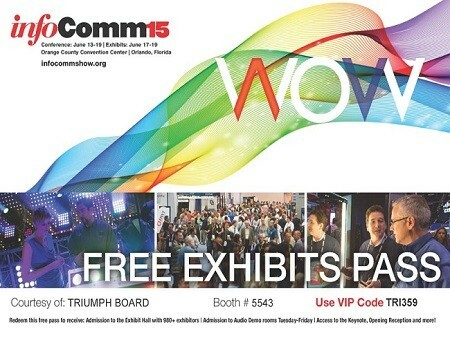 TRIUMPH BOARD WILL BE EXHIBITING AT THE InfoComm 2015 in Orlando, from June 17 – 19th, 2015! We would like to invite you to another event where TRIUMPH BOARD present the entire product line including the completely new 2015 series as well as the new Android-based interactive LED LCDs and new MULTI Touch Interactive Whiteboards with TRIUMPH CLOUD USB Stick Bundle edition and hot new features in TRIUMPH CLOUD software. TRIUMPH BOARD will also launch on InfoComm new Video Conferencing System, integrated with our LED LCD screens. Come to check it out! Visit us at the booth #5543.